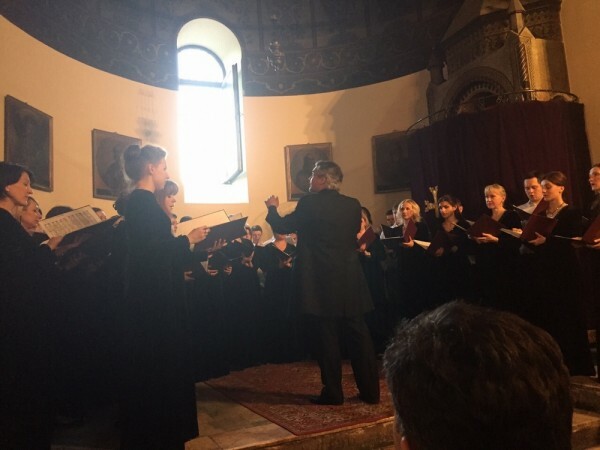 On 6 June 2015, the Moscow Synodal choir gave a concert at the centre of the Armenian Apostolic Church, Etchmiadzin, in the context of commemoration of the centennial of the Armenian Genocide. His Holiness Karekin II, Supreme Catholic and Patriarch of All Armenians, attended the concert as an honoured guest. Bishop Natan Hovhannisyan greeted the audience on behalf of His Holiness. The Moscow Synodal choir, conducted by the Honoured Artist of Russia, Alexei Puzakov, performed pieces of Russian religious music and hymns in the Armenian language.